Don't worry. Be happy. Keep learning. 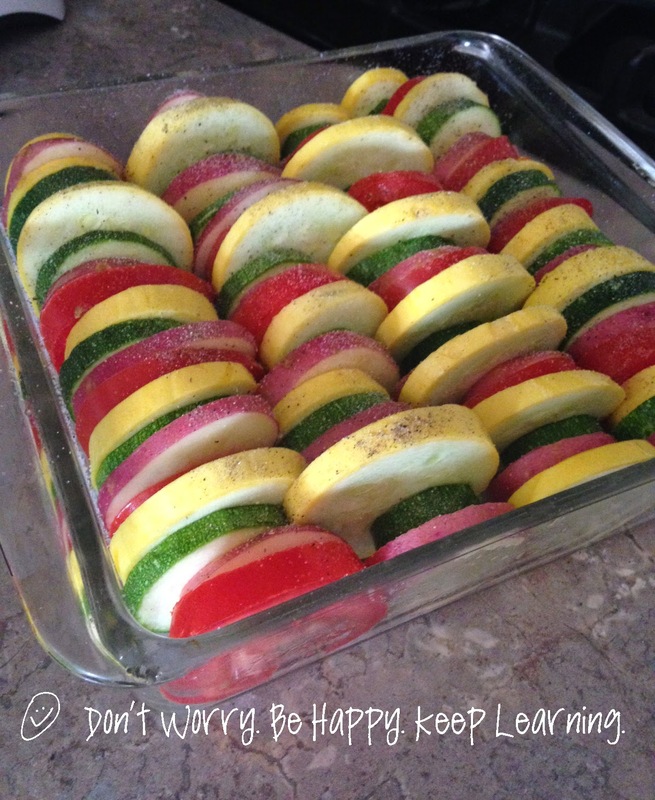 : Fresh Summer Veggie Bake. WARNING: This recipe was delicious! Okay, maybe not a warning . . . but an alert so you're prepared for major YUM! 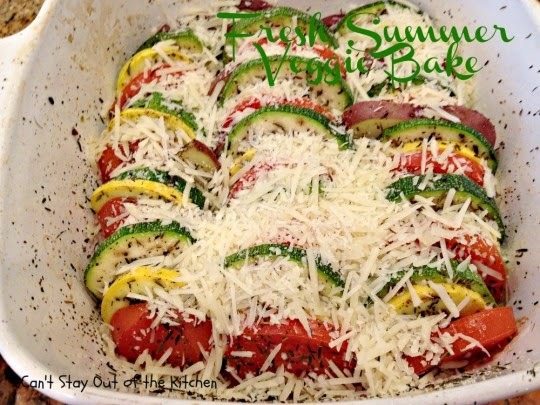 I found this recipe for Fresh Summer Veggie Bake on Can't Stay Out Of The Kitchen. I knew I wanted to make it for our annual family get together for Memorial Day weekend. Like a pinhead (that's an awesome person who pins lots of things, makes said things and then forgets to take pictures of the final product), I forgot to take pictures of the final product. Or really I forgot to take any pictures except ONE, right before I put it in the oven. Here's how Teresa's turned out (She's the author of Can't Stay Out Of The Kitchen). It has yellow squash zucchini, green zucchini, potatoes (I used red) and tomatoes. You sauté garlic and onions, put those in the bottom of the dish, then slice all the veggies and layer those in. Then you add a couple spices and pop it in the oven. After that, you add some parmesan cheese and put it back in the oven. It's so easy! And it's pretty to look at, too! I did take a pic of how mine looked right before putting it in the oven. But that's all you get from me. Sorry. This was pre-cheese which is the best part. I added mozzarella cheese in addition to shredded parmesan cheese. I'll be doing THAT again. I'm such a sucker for mozzarella cheese! **Another thing to remember when making this, cut your tomatoes thicker than the rest of the veggies. They'll break down in the oven and if they're too thin they'll turn to sauce. You don't want that. . .
at 11:31 AM Topics: Blog., Recipes.